As you surely have already noticed, Adobe has just surprised us by releasing an update of the software that photographers love the most, that means Photoshop and Lightroom (CC and Classic CC), and obviously also Camera Raw. Normally these intermediate updates are aimed at solving bugs rather than bringing actual improvements, and, at best, Camera Raw is normally updated in order to support new camera models. But this time the situation is different, or, to be more precise, some important changes have taken place: Profiles have been updated. With this article, we are going to see what does this mean, especially with regard to landscape photographers. Without resorting to technicalities or long nerd dissertations, let’s try to understand what we are talking about by making it as simple as possible. Although it’s not really romantic, every time you shoot in RAW you are not shooting an actual photo as you might imagine, but the sensor of your camera is simply capturing informations that are then written to the memory card. These informations are nothing but numerical sequences that are different for every pixel of our sensor. 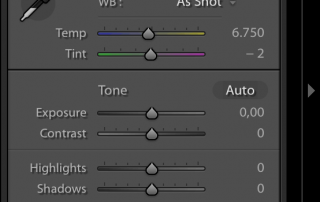 When we open the RAW file in Adobe Lightroom or in any other photo editing software, a rendering process takes place, and this actually transforms those numerical informations into what we call an image: finally numbers are turned into colors and tones that we can see. This transformation can take place thanks to so-called Profiles. It is therefore easy to grasp that, depending on the Profile used, the result of this transformation from numbers to colors will be different, and this is the reason why if we open the same RAW file in Adobe Lightroom and in another non-Adobe software, we will surely find ourselves in front of two different images. With this update at the beginning of April 2018, Adobe has decided to take care of a deficiency that, in my opinion, is the most serious of all the deficiencies found in the past updates, and that means exactly Profiles. Until yesterday, the Adobe suite used fundamentally two Profile families: the “Adobe” family and the “Camera” family. The “Adobe” family included various “child” Profiles which, according to Adobe itself, could best interpret the data captured by the camera. On the other hand, the various “Camera” Profiles offered a data interpretation coming not from the side of those that elaborated these data (Adobe) but from the side of those who captured them, meaning that they were Profiles made by camera manufacturers. Which one of the two families was right? Neither of them, because it was an arbitrary interpretation of data, and so they both wanted to have their say by right. We landscape photographers have learned that the universal profile did not exist and depending on the peculiarities of the shot in terms of exposure and expected tones, we had to choose one Profile over another. Over the years, the Adobe competitors have become tougher and some developers have invested in Profiles much more than Adobe did, as it actually left us with Profiles dating back to more than ten years ago. I have to confess that I have been seduced by the dark side too, and for some months I have elaborated my images side by side with two different softwares, on the one hand in order to benefit from the higher-performance Profiles, and on the other hand I was adamant that I would not give up with my beloved Adobe Lightroom. Thanks to this last update from Adobe, we now have six new “Adobe” Profiles available. The Adobe promise is that of making available to us new renderings that are accurate and independent of the camera used. You may remember some of them as they were already included in the previous versions, and therefore they have only been updated. While others, like Adobe Color, are something brand new…and as such they make us quite curious. Adobe also announces the presence of “Creative Profiles”…we’ll see, although given their name they don’t really attract me. It seems that it will also be possible to finally purchase and import third-party Profiles: this is great news, especially in case there won’t be anything that pleases us, among the Profiles that are now included, and maybe out there there is someone able to create our dream Profile. None of the three was the perfect Profile, and every time I used one of them I was envious while looking at how those RAW files were interpreted when opened using competing softwares. In this new update of the Adobe suite we see the introduction of a Profile that’s really seducing me: Adobe Color. 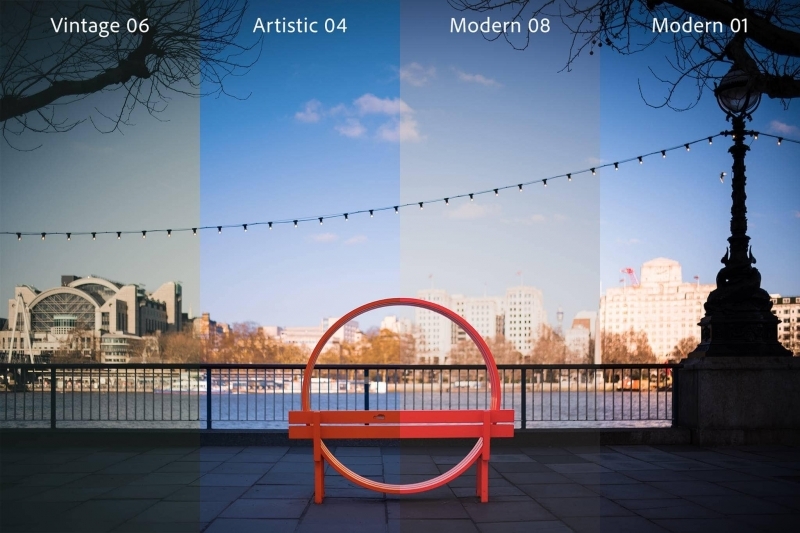 According to Adobe itself, Adobe Color represents the evolution of Adobe Standard. Conceived to optimize the rendering of warm tones, it also promises to improve the contrast of our images, favoring color transitions in certain ranges of tones. Will this hold true? We’ll find out. Driven by the craving for trying the new Adobe Color profile and the updates of the other Profiles as well, we notice that something has changed with regard to the interface of Adobe Lightroom Classic CC. In the previous versions, Profile selection was made through the “Calibration” panel. 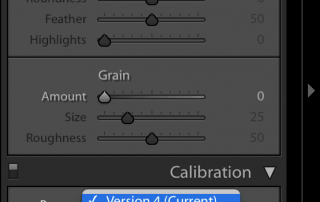 With this new update, only the “Process” selection is left within “Calibration”, and we are going to leave it at “Version 4 (Current)”. Profile selection has been moved to the “Basic” panel. 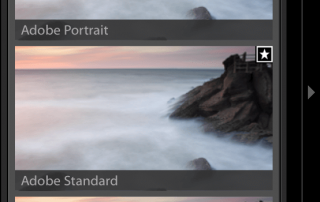 I do believe that this is more correct, as Profile selection is one of the very first things that we have to do (I still dream about the day when Lightroom will allow me to modify and move the various panels so as to create my development workflow according to my taste…). If at the beginning Profile selection seems limited or confusing, we just have to click on the icon on the right of “Profile” so that the relevant panel will appear and everything will be clearer. First of all we can choose if we want to visualize all the available Profiles or just the groups “Color” and “B&W”. After this, always through drop-down menus it is possible to open or close the Profile family we are interested in. In all I can count 70 (seventy) Profiles. I am dumbfounded. In order to test the various Profile, it is necessary to take a heterogeneous group of images, or better, images that have very different characteristics though however potentially repetitive. Well no…just a note first: the images we are going to discuss are absolutely immaculate RAW. All I’ve done has just been the application of the lens correction profile. I show you the “privacy” of my RAW files with the purpose of showing to you the difference in the results obtained with the various Profiles chosen to begin our post production. The reference for the comparison will always be Adobe Standard, which, after more than ten years of honorable service, deserves the upside and downside of being the reference point. In the end, everything is based on my visual perception and my personal taste, therefore what I like is not necessarily what you will like! As the title suggests, the peculiarity of these types of shots is the presence of warm tones, the tendency to overexposure and the absence, or nearly absence, of shadows to be recovered. Normally in these shots it is possible to have a few points of overexposure to recover. In such a case, I generally used to find shelter in Camera Standard. In fact, that profile normally favors the recovery of highlights though at the expense of an increase in contrast and therefore leading to a darkening of the shadows. That effect was never a problem because generally we start with an image whose histogram tends more to the right rather than the left. It was unlikely that in those cases I happened to use an Adobe Neutral Profile: even though the highlights are recovered, the whole image is completely flattened, and even if it is possible to recover interesting tone transitions in the highlights, generally we lose them in the midtones and in the darker tones. So let’s go to discover the Adobe Color Profile. The highlights are actually recovered, even if it seems to me that some transitions of warm tones in the sky area are lost. I am not particularly satisfied, especially given the declared purpose of this Profile. On the other hand, I am absolutely satisfied with regard to the overall contrast and the color in midtones and shadows: the image comes alive by simply applying the profile. Considering that for such an image until yesterday I would have probably used Camera Standard, let’s now compare it to Adobe Color. In the highlights of the warm sky, Adobe Color doesn’t really convince me like it has done when compared to Adobe Standard. 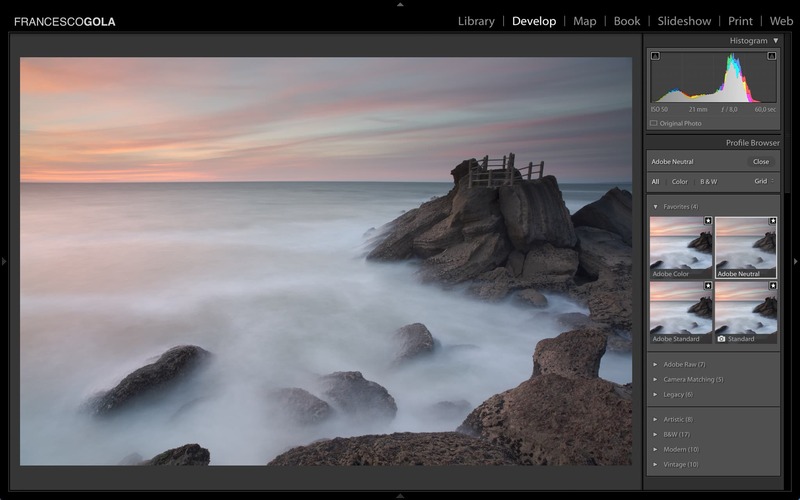 However once again, in terms of both contrast and overall tones, Adobe Color resolves the image much better. For example look at the vegetation with the yellow flowers in the foreground: I don’t know what you think about it, but in my opinion, with regard to both contrast and colors, Adobe Color is really one step ahead! So who is the winner of this comparison? If we stopped here, considering that the part of the image that’s difficult to manage is the sky, then Camera Standard would work better. Though it is necessary to make two additional remarks: the first is that my Camera Standard will be probably different from yours unless we take shots with the same camera. The second is that we don’t have any unrecoverable overexposure. 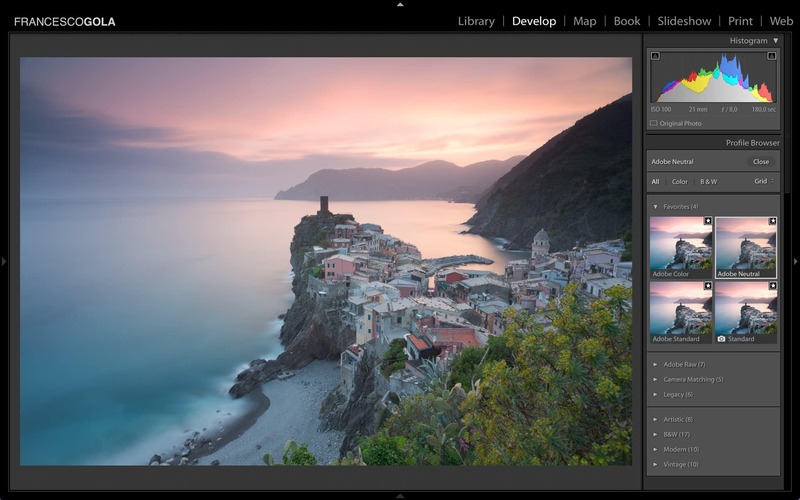 If we maintain Adobe Color and we take action for recovering the highlights through the Base panel, we actually recover 100% of those tone transitions in the sky, which seemed lost, while maintaining unchanged the benefits given by Adobe Color to the rest of the image, which we don’t have when using Camera Standard. When comparing the two images again, at this point I have no doubts: Adobe Color wins. The reference image chosen in this case is characterized by a soft light and pastel colors, a typical case in which you might have the fortune to take shots of a colored sunset or sunrise without necessarily having the brighter portion of the scenery within the frame. Even though the histogram tends to the right, we are very far from any ideas of overexposure. With such a shot, normally Adobe Standard wins hands down. Camera Standard in my case tends to darken the shadows too much, and the gain in terms of contrast and colors is absolutely negligible. Here again Adobe Neutral doesn’t really help us, because the image is already neutral on its own, therefore it just opens the shadows with no real benefits, while penalizing us in the delicate transitions of pastel colors. And what about the new Adobe Color? I really like the result. The sky gets slightly saturated and turns to slightly warmer tones. The sea becomes more contrasted and also here the warm tones are enhanced. On the rocks the increase in contrast causes a slight darkening of the shadows, but here again we can appreciate an increase in the overall saturation. In this case I would really have no doubts: the Adobe Color Profile is the one for me. Those who know me know that I love blue. I love it so much that over the years my brain has started to favor a certain shade of blue, so that my friends now playfully call me Blue Frank. 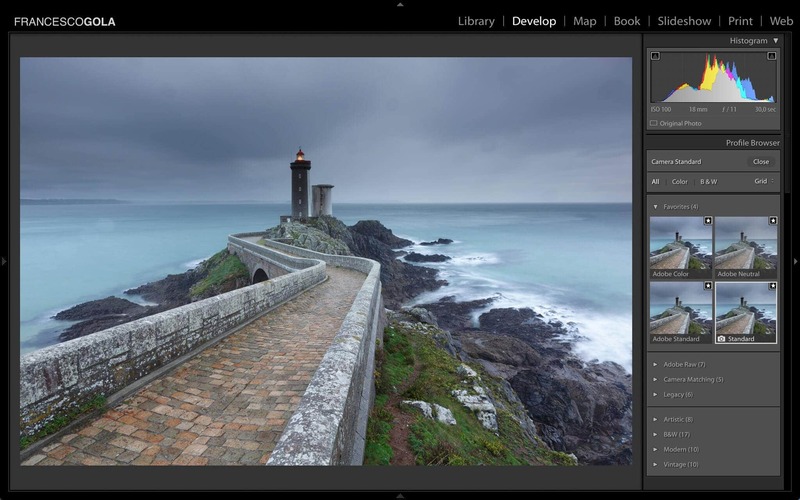 The typical histogram for these types of images is the Gaussian curve perfect in the midtones, therefore the easiest situation to manage in post production. Here the warm tones that Adobe Color would favor aren’t even there, and therefore I’m really curious to see how it behaves. Normally with these types of images Camera Standard helps a lot: colors are saturated, contrast increases. 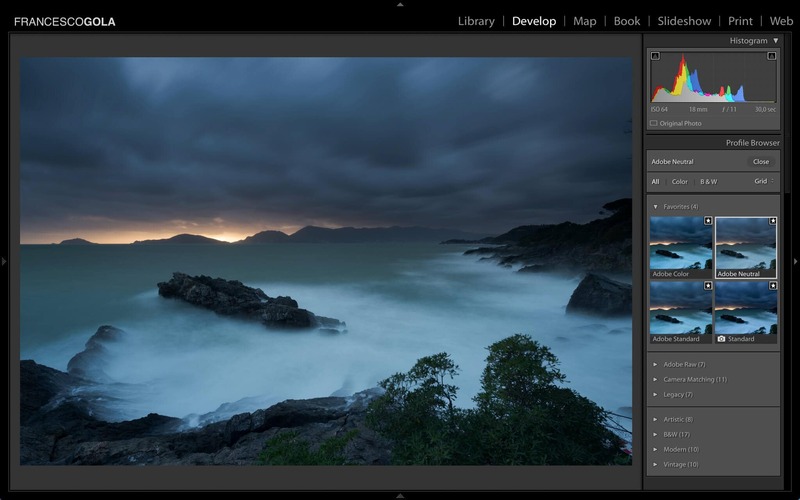 Since they are images that almost always have a sky completely covered and tending to neutral tones, the increase in contrast provided by Camera Standard is more than welcomed. Because of what we have said about the typical histogram of these types of images, using Adobe Neutral is usually a very bad idea. Apart from the loss of contrast, even the colors of the sea and my beloved blue are washed out. 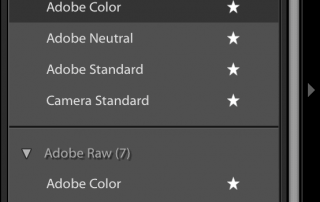 So the comparison between Camera Standard and the new Adobe Color becomes really interesting. The result leaves me ecstatic: the shadows slightly open even though the contrast increases (look at the rocks next to the sea at the lower right). The color of water gets pleasantly saturated and slightly turns its tone. With these types of shots the new Adobe Color Profile conquers me unconditionally! Even if 90% of my images falls within the cases presented with the images from 1 to 3, let’s try to overdo it with something particular. This is a shot where, in order to capture the light with a single exposure, it is necessary to stay highly underexposed because a portion of the image is very bright. Nevertheless, a very small portion will appear burnt when we apply the Adobe Standard Profile. In these cases, at first I normally try to use my loyal Camera Standard. It actually does its job: the sky portion that appeared burnt is completely recovered. Unfortunately, the price to pay is a strong increase in contrast which causes a significant underexposure (look at the histogram). This doesn’t really help us, as the image was already highly underexposed. This is the case in which Adobe Neutral can assert itself: the burnt portion is recovered, the image does not get contrasted (it actually gets flattened) and therefore we don’t have underexposure problems. Surely we lose something in terms of color intensity, therefore we will have to pay much attention to this aspect during post production. What happens if we apply Adobe Color? 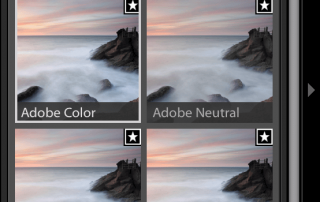 As you can see in the images above and below, the new Profile Adobe Color is able to recover the highlights like Camera Standard does, without increasing the contrast too much. Compared to Adobe Neutral, I believe it does a better job in recovering the warm transitions in the sky and the respective contrast, but the post production work on the rest of the image will require greater attention, especially in terms of recovering the shadows. 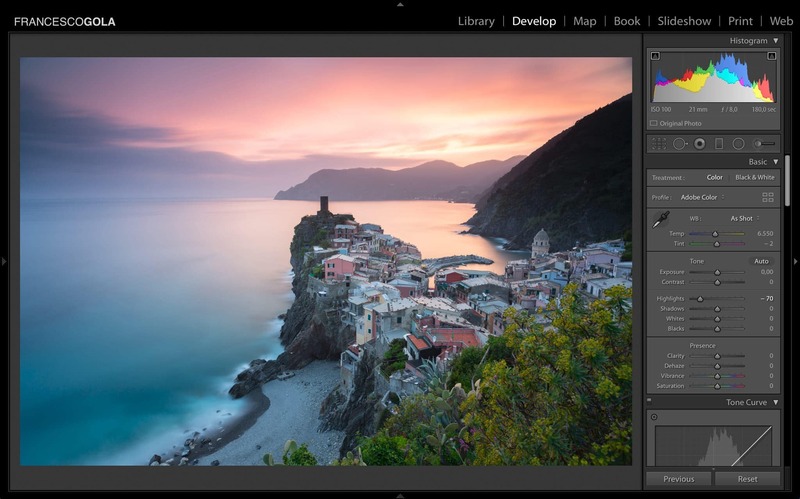 In this case I’m not sure that Adobe Color is the best choice, even though compared to the old Adobe Standard it is surely one huge step ahead and we are dealing with a very particular image, with regard to exposure, and as far as I’m concerned this does not represent the most part of the case record. This update for the Adobe suite has been unexpected as well as very pleasing. 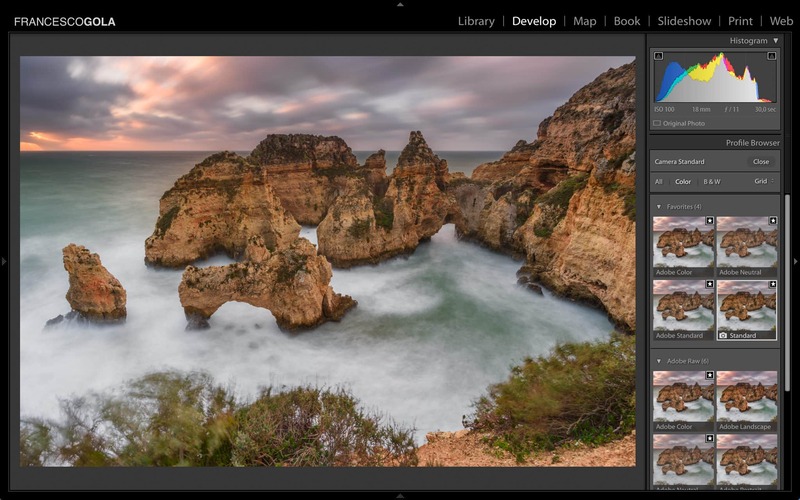 The introduction of new profiles and the improvements to those already existing doubtlessly represent a step forward for the company toward what photographers have been asking for quite a long time. In the field of landscape photography, I do believe that the introduction of the Adobe Color profile is a really significant step forward. Without any doubt I’m curious to try to apply it during my next developments, and I’m even more curious to compare it with profiles of competing softwares because I’m quite sure that this time it will be a game on equal terms!